What Value Does Page 1 Of Google Have? Internet Marketing, as we all know, is about getting seen. And the general perception is that the only way to do this is to get on Page 1 of Google (and ideally at position 1 on page 1). There are of course many other ways to be seen, but for now let’s look at the logic behind the thinking. Back in the early days of the internet, marketers fought bitter battles over how to grab attention. They did it with clever banner advertising and a dozen other methods. This was also around the time everyone with a computer dabbled with graphic design due to the advent of Desktop Publishing. And with home colour printing, home publishing, and HTML most of us believed we could ditch all those expensive marketing and design gurus and go it alone. In the short term this saved a fortune, but the results soon dwindled away. You can give a monkey a pen and paper, but you won’t get a Saatchi & Saatchi. All this still goes on today of course, but now we use places like Fiverr.com to get our graphics done professionally and cheaply. The problem is your ads now get lost in ‘banner blindness’, plus those ads now cost a fortune and without constant split testing you are unlikely to get a return on investment. So the focus changed to SEO and organic growth and the search engines became more and more the focus of long term marketers. So marketers started pushing this ‘get on to page 1’ concept and everyone wanted it. The problem is that getting on to page 1 does not necessarily bring traffic. 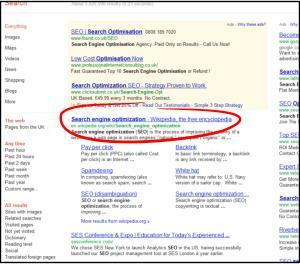 If you target a keyword that no one is searching for it is very easy to do, but you get no traffic. You can also target an irrelevant (non-buying) keyword, get loads of traffic, but have it all bounce and reduce your Google rankings. So, what is it about page 1 of any search engine that makes it still so attractive to so many? The answer is ‘relevancy’. Probably the oldest marketing principle. There have been many studies using eye-tracking ‘heat’ maps to see where people first look on a page. And exactly as you would expect, on a search results page they look top left. The research shows that the eye scans down and to the right equally. This is because once you see the title, if it looks OK, you then check the description, before continuing down the page. There are also hotspots where images are displayed, so Images, Video, Shopping and News results can all distract from the main search. A study by Cornell University in 2004 (very old I know, but humans don’t evolve very fast) showed 56% of viewers clicked on the first link. However, this study is probably flawed by too few participants and pre-selected keywords. A later study (actually it was an accident – the data was leaked) of AOL users shows 42% of clicks are made on the number 1 spot. Another study based on the above adds more detail but shows that nearly 96% of all clicks are on the first page of Google. So whatever way you look at it, pretty much half the clicks for ANY keyword are made on the number 1 position on page 1. Positions 2 and 3 are important, but after that it doesn’t matter much. So your target has to be position 1. But, and this is the take-away from this, if your keyword has massive search volume then any position on page 1 is okay. And you can maximise it by testing with different meta tags for title and description. This is usually what is displayed by the SE’s when they show your page in the results. If your title answers whatever it is the searcher is looking for, and the description compounds that, then you can sway the clicks towards you. If your landing page includes all the relevant onpage SEO stuff you should be doing, then it will help not only in being relevant to the SE, but also for the searcher who is likely to stay on that page longer, and therefore increase its relevance to the SE. There is loads more to this, but one more tip is really all you need to ensure you are doing all the basic stuff: Add a relevant internal link to your landing page. Use teaser anchor text (eg. ‘I go into more detail about x here…’). If your searcher hits your page, stays there long enough to get to your internal link (because your content is relevant and great), then clicks it, the SE’s will love your page even more and your bounce rate will go down. If you have taken a look at Google Analytics recently, you may have noticed a brilliant feature, which shows you how users navigate through your site. This is absolutely invaluable. It shows you where your users decide to exit or stay on your site. Make sure you sign up to my Inner Circle to get the inside view on this. The form is just at the top on the right.